Online communities often stay online, but when they bridge into the real world, reality expands, people change and movements begin. The MeetUp platform, launched in response to 9/11 in New York, has vaulted out of computer screens to connect real people meeting in the real world, whether they want to talk about adventure travel or poodles. TED Talks are live events with high ticket prices, but their free online component (videos) unite people offline and on in a celebration of ideas. PlantVillage creates connection between people who want information about the food they grow. It's a free, open-access knowledge base about edible plants. On their website you can participate in a worldwide Q&A and there's a growing library section. Now a just-launched mobile app is available in the iTunes Store. Why would it matter to share knowledge about plants? Because when you're talking crops, you're talking food. By mid-century, we'll have an estimated nine billion people to feed on the planet. "We do this because we feel that knowledge about growing food plants is a basic human right," says PlantVillage co-founder Marcel Salathé. He's a professor of biology at Penn State, and along with David Hughes, a Penn State assistant professor of entomology and biology, they created and maintain PlantVillage. After the site caught on worldwide -- there's a great need for food plant information -- the next step for Salathé and Hughes was naturally a mobile app. "Because plants are in the field it makes sense to bring the computer there, through the enormously powerful phones we carry around. With the built-in cameras users can take images of plants and ask questions, right next to the plant," Hughes wrote me in an email. Whether food is grown on a large, industrial farm or on a small plot, the bugs eating the crops and the diseases sweeping through, all demand solutions. Knowledge is power, and it's a relatively new thing for plant information to be open-sourced, as it is on the PlantVillage site and app. According to Hughes, formerly most food crop information was kept under wraps, the property of chemical and pesticide companies commissioning research studies, or else the information was closely held by Big Ag, and it often cost money to access. PlantVillage, in contrast, provides it for free. "We want to democratize the access to the world's knowledge on food plants," says Hughes. As a worldwide online community, PlantVillage is thriving. Since launching this past February, the site has had more than 100,000 visitors from 191 countries. The knowledge base has expanded to include more than 150 crops, 1,100 disease entries and 450 pictures. You'll find nearly 1,500 questions and answers about food plants on the site. Wikipedia has been mocked for providing wrong answers and false information. PlantVillage, also in the wiki mode, makes an effort to source its information by connecting plant growers with experts. They've got Land Grant and private university scientists, extension officers, master gardeners, scientists from USDA, backyard growers, community garden growers and seed companies all talking. "The reaction we get from this very diverse community is very positive," says David Hughes. "For disease biology and crop health we are learning through our platform where gaps in understanding disease dynamics exist. This simply has not been collected before because of short term studies. So, going forward this will be very important." 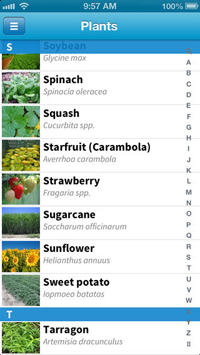 Though growing plants for food has been going on for a very long time, it's only recent online technology that allows for a mobile, crowdsourced plant knowledge system. Hughes and Salathé see PlantVillage developing into a open-access, global plant disease surveillance platform, leveraging the powerful photo and GPS capabilities of smartphones. With the ubiquity of smartphones (an estimated 6.8 billion mobile subscriptions worldwide), this technology is one way we might meet the challenge of feeding nine billion people on the planet. 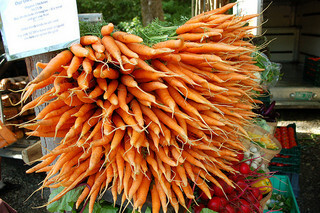 Carrot image credit: Carly & Art via Creative Commons. PlantVillage screen shots courtesy David Hughes.